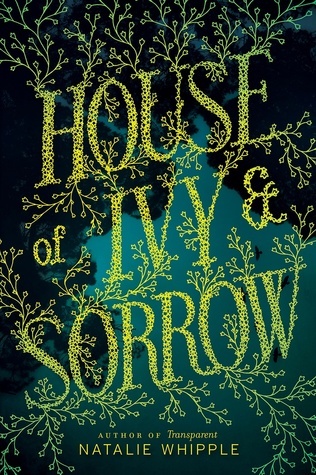 The House of Ivy and Sorrow is my second book by Natalie Whipple and like her debut Transparent, I found it entertaining, but far from impressive. It is a cute, but entirely forgettable story about a young witch and her small community. By now, you’ve probably realized that this cover and title are awfully misleading. The House of Ivy and Sorrow is a far cry from the dark, gothic novel I’d been hoping to read. Deceptive advertizing doesn’t work in this book’s favor, and I can’t for the life of me understand why someone would do it. On the other hand, I appreciate a decent sense of humor, and Natalie Whipple certainly has it. I’ve taken the time to read a few reviews right before starting this novel, so I knew to expect more silliness than anything else. If you take it as such, The House of Ivy and Sorrow can be quite entertaining. It’s only if you go into it expecting a serious novel that you’ll end up sorely disappointed. Josephine Hemlock is strong, opinionated, likeable and unfortunately, unmemorable. She strikes me as a character written for readers, not for herself. She is exactly the type of girl everyone can like, without risky idiosyncrasies to make her stand out. I found her characterization to be sorely lacking, in nuance or in depth. The story itself is interesting enough – with better characters and better background, it had the potential to become amazing. I liked this idea of a curse following Jo and her family, and I thought the witch lore was original and interesting. But without good characters to back it up, none of it is worth very much. The House of Ivy and Sorrow might work for younger readers, just like Transparent, but as an adult, I don’t think Whipple is the right author for me. Her lack of attention to details and superficial characterizations are impossible to overlook. I'm disappointed this isn't a gothic read. With the cover and title clearly steering this towards one direction, it's odd that the story is entirely different. Like you, however, I don't think this author's works are for me. I'd need a lot of improvement and depth in many areas, so I'll be skipping this for sure. Thanks for such a clear, concise, and helpful review, Maja! I started this book some time back, but eventually gave up when I realized it wasn't what I was expecting. Like you said, that cover is so misleading. I wanted a dark, gothic story, but it was a little too fluffy for me. I didn't connect with the MC either. It sounds like I made the right decision not continuing this one. Yep. I had a similar reaction. This was my first book by this author and I expected a much darker book from the title/cover. I'm with you, it had its moments but overall I was disappointed. Great review! I didn't have the greatest luck with Whipple's book Transparent, so I'm not too sure that this book would be for me either. Which is a real shame, as it sounds like this book certainly does have a lot to offer. Sorry you weren't able to enjoy it as much Maja! I've read another review that commented on the title/cover being misleading. That's never a good thing! Sorry this didn't work for you. I would imagine it to be a more serious book too. I keep hearing a lot about how immature the characters sounded and that the name and cover did not really fit the plot. Disappointing. Yes I agree with you. I did enjoy the characters but it did read quite young. I think she would be perfect for writing for the MG crowd. Sorry this was such a disappointment, Maja. Though I can understand why. I hate when a cover doesn't live up to its promise. There's just way too many problems to this book that I can't even feign an ounce of interest. I've read Transparent and while I enjoyed it, I didn't think it was anything special. It seems like that statement would apply to this one as well were I to read it, Maja. I may give this one a try in the future if I'm bored and looking for an easy read, but I'll at least go into it knowing not to expect anything serious or dark. Thanks! I hate when he marketing is misleading. You may draw in a few more readers but no that you've been burned, you are less likely to take another chance. It seems that most of the reviews I've read concur with your opinion. Dang, I hate it when titles are misleading. That's one of the best parts about a book! As are the characters. I know I love a book when I love the characters. If they are not developed well, then it's hard to like the story. I wasn't planning on reading this one and all the reviews I've seen so far have me pretty pleased with that decision. This sounds like something I'd maybe recommend to a younger reader, but definitely not something I'd be interested in. Thank you for your honest review! I agree, Maja. This book is so forgettable and insignificant. The main character was so dense and boring, it was just so irksome! And way too fluffy, I'd say. I took this off the pile after the influx of negative reviews, and yours just confirms that this probably won't be for me. Although I do like a good bit of humour and entertainment, I find a book rarely stays with me when the characterisations are less than stellar. It's a shame this didn't impress, but thanks for the honest thoughts, Maja!